First it was Seth Rollins, then it was Dean Ambrose’s turn to take centre stage, so continuing the Shield theme, it seems only and right fitting that the third chapter in Dennis Hopeless’ ongoing run on WWE should be dedicated to the powerhouse of the group, Roman Reigns. Much as he did with Rollins and Ambrose, albeit slightly less fantastical than the Dean’s tale thanks to Hopeless adopting a less Scooby Doo more Rocky approach to Roman’s story, Dennis Hopeless gets in the head of his subject and allows Reign’s unique, highly driven mind-set to guide his hand in Roman Empire. 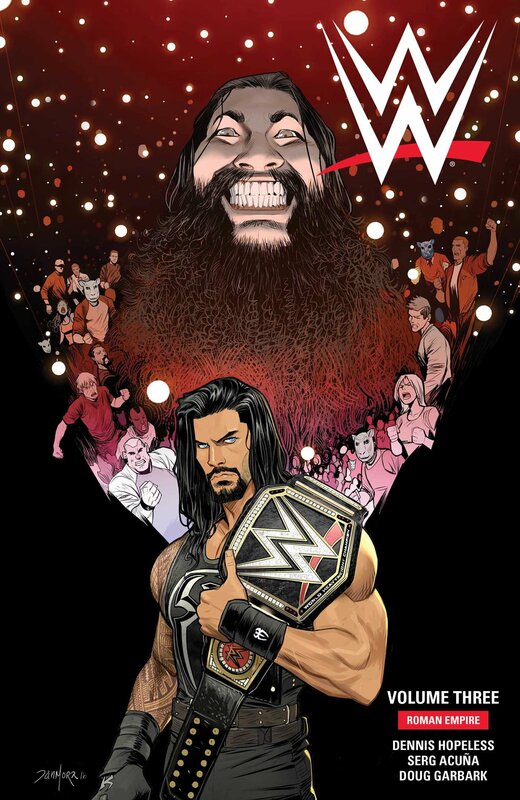 Fuelled by a desire to constantly prove himself and be seen as a legitimate hero of the squared circle, who at the beginning of his journey can’t understand the fans negative reaction to him and their overwhelmingly positive adoration of his former comrades in arms, Roman Reign is the perfect subject matter, and character, for Hopeless to get behind and really sink his teeth into. Charting his fall from championship grace and the slow and difficult trek to assume his former mantle, Roman Empire explores and examines the personality of the man behind the fiery temper who takes every trial and tribulation on his path to the belt personally. Whether it’s the weight of expectation that he, as a third generation Wrestler from the second most famous family in the business, constantly carries on his shoulders, the betrayal that he’s always wary of or the clash of personalities that he thinks is holding him back, Reigns life is complicated by the fact that he is often seen as being his own worst enemy and the only major obstacle standing in his way, is himself. And Roman Empire is the story of how he overcomes the hurdles in his way and learns to be at peace with himself and thus becomes the man, and Wrestler, he was always meant to be.